Before the period instrument ensembles, there was I Musici, more formally known today as I Musici di Roma. Founded in 1952 by 12 musicians and mainly graduates of the Accademia Nazionale di Santa Cecilia from Rome, their 1955 recording of Vivaldi's Four Seasons became the first commercially successful recording of the piece which literally sparked the public's new interest in the now world-famous piece and Vivaldi's music in general. I Musici played a prominent role in recording and interpreting Baroque music, with an emphasis on Italian composers. 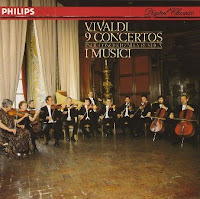 They have had a very long relationship with Vivaldi, whom they have recorded all of his 12 published opuses. Their recordings of Albinoni's op.5, 7, and 9 also introduced other music of Albinoni other than that Adagio for Strings to a wider audience. Still performing and recording today but with different members (obviously), I Musici has come to epitomize the practice of performing Baroque music on modern instruments. With no conductor, the musicians of I Musici have such great harmony that represent great chamber music playing. This CD of Vivaldi's 9 string concertos was a gift my dad gave to me when I was still in 6th grade upon returning from a European conference. After The Four Seasons, I craved more, and this CD was a very pleasant surprise and addition. I Musici's playing is characterized by a lush but not overwhelming sound combined with steady tempi to portray elegance. This CD ends with the famous Concerto "alla Rustica," a short but lively concerto. Advocates of period performance practices will find these performances a little outdated, not nearly as exciting as some of their younger Italian fellow ensembles like Fabio Biondi's Europa Galante. However, listeners just starting into the Baroque genre will find I Musici's interpretation a safe choice.